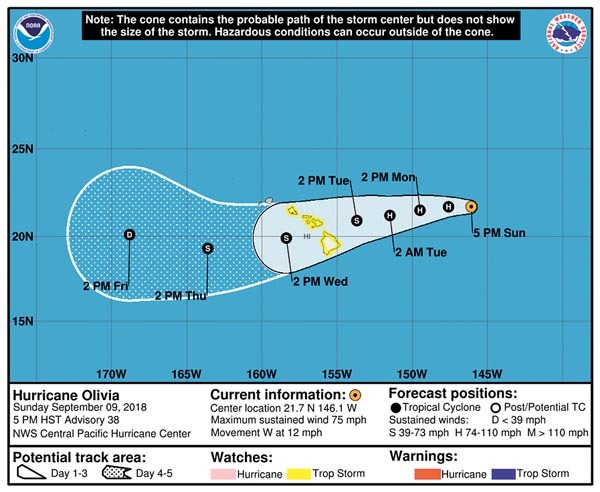 The National Weather Service issued a tropical storm watch for Maui County on Sunday afternoon as Hurricane Olivia prepared to pass directly over the islands. On Sunday afternoon, Olivia was about 595 miles east-northeast of Hilo and was narrowly registering as a Category 1 hurricane moving west at 12 mph with maximum sustained winds at about 75 miles per hour. The Central Pacific Hurricane Center has projected that Olivia will weaken and likely be a tropical storm by the time it hits the islands late Tuesday through Wednesday. A tropical storm watch means that tropical storm conditions are possible within the watch area within 48 hours. The National Weather Service reminded residents not to focus on the exact forecast track and intensity when planning for Olivia. Residents should continue preparing for the likelihood of direct impacts from the storm, which could include intense flooding, rainfall, damaging winds, large and dangerous surf and storm surge. Impacts of the hurricane can also extend far from the center of the storm. Maui County is expected to experience tropical storm-level winds starting Tuesday. Total rainfall from the storm is projected at 10 to 15 inches, with isolated amounts over 20 inches. Large swells generated by Olivia will also likely increase throughout the week and may become damaging on some exposed east-facing shores Tuesday or Wednesday. Maui County Emergency Management Agency will continue to monitor the situation. Local radio and TV stations and the National Oceanic and Atmospheric Association radio will also provide updates. Residents can get NOAA weather updates by calling (866) 944-5025 or by visiting weather.gov/hawaii. Pre-recorded advisories and notifications are available 24 hours a day on the Maui County automated information system by calling 986-1200. For information on preparing for the storm, visit mauicounty.gov/emergency. To track the storm, visit prh.noaa.gov/cphc.